Do you consider the work you need to do each day and then decide where you should work based on what you need to get done? Collaborative working expert Sabrina Simpson tells us why we should be doing exactly that. Making sure you are working in the right space for the kind of work you need to do sounds obvious, doesn’t it? Taking the time to tailor where you work for different kinds of activities can make a huge difference in your productivity. Most of us need at least four different types of working spaces: a place for focused concentration, space for group project work and meetings, learning space (classrooms) and finally, social space to meet with colleagues in a more casual atmosphere. Each space has particular features and attributes that make getting those particular tasks done more efficient and effective. For example, think about the kind of space you might want if you are meeting with a new client: you will choose a space where you can have a professional conversation and perhaps review a document together, or showcase samples of some kind. You probably want a table, perhaps a white board, and possibly some beverages to drink. You might want some sense of privacy. If you work from home, you may go to a local coffee shop for a meeting, but what about a nice hotel lobby instead? If you can choose a quiet place to meet, you will set a respectful and professional tone. If you are here in Plymouth, consider one of the larger restaurants in off hours, so you can have some room to yourself, and won’t be interrupted or overheard. No matter where you work, if it is a nice day, what about going for a walk? There are many benefits of walking meetings, and the fresh air can stimulate more interesting conversations than in a meeting room or coffee shop. If it is a particularly difficult conversation, walking side by side leads to a more collegial feeling than sitting opposite across a desk or table that leads to a feeling of confrontation. At the other end of the spectrum, if you work in an office with loud bustling open plan seating, and you really need to concentrate on your work, try to find an available conference room so you can shut the door. Or see if you can work out of the office for a few hours, or borrow someone’s private office (with their permission of course!) If none of those options are available, try headphones to help you tune out the surrounding conversations and focus on your tasks. Unless you work in a big office, flexible learning spaces can be hard to come by, so think about the resources available in your community: bigger hotels have conference rooms; Millfield’s Trust, Devonport Guildhall, and other organisations have meeting rooms for rent. Although it seems like an added expense, spaces that are purpose built for learning – with projectors, screens, big drawing boards, flexible seating, etc. – will allow you to conduct your training far more efficiently and effectively. Of course your local coworking space has some nice conference room space available to use as well! Often overlooked, but no less important are social spaces. These spaces provide the glue between where people show their true passions and where work gets done: it is where new ideas sparkle to life. If you work in an office, make sure your kitchen-eating area has spaces where people can linger over their drinks and snacks, and even have a short meeting. If you work from home, be sure to get out and attend meet-ups, professional association meetings, networking events, and other activities to stimulate your professional growth. By meeting others in your field of expertise and those in completely different fields, you will expand your knowledge and connections leading to all kinds of unexpected opportunities. These are just a few suggestions for ways to make your working space work for you. Give one of them a try and see if you don’t get more from your efforts. Or at least feel as if you didn’t waste time trying to get your work done! This is a guest article written by Sabrina Simpson. 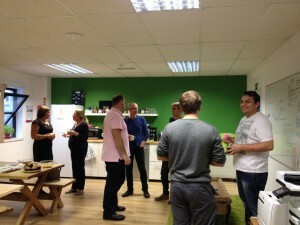 Sabrina is well known in Plymouth as our foremost advocate of success through coworking and collaboration. She is also one of the people responsible for bring thinqtanq to Plymouth. thinqtanq is the freshest creative collaborative coworking and office space in Plymouth. It attracts a wide range of new businesses and freelancers by providing a flexible place where small businesses can hire short-term office facilities and meeting rooms. You can also connect with Sabrina Simpson on Twitter via @PlymCoWork.